Published: Nov. 18, 2013 at 03:17 a.m.
(10:02) R.Rice right tackle for 1 yard, TOUCHDOWN. 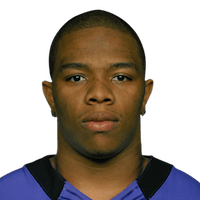 Published: Nov. 17, 2013 at 01:27 p.m.
Baltimore Ravens running back Ray Rice takes it in from 1 yard out for the touchdown to help the Ravens go up 7-0 on the Bears. Published: Nov. 17, 2013 at 01:25 p.m.
Baltimore Ravens running back Ray Rice sprints up the middle for a 47-yard gain to get the Ravens into the red zone against the Bears. Published: Oct. 7, 2013 at 09:09 a.m.
(12:10) R.Rice left tackle for 3 yards, TOUCHDOWN.